Christmas is an exciting time but it can get a bit intense, especially when you don’t know what to get for people you love (or when you put the gift shopping off – guilty!). Whether you’re doing Secret Santa with your family and/or friends, getting one big gift or multiple small(ish) ones, you are guaranteed to find an amazing selection and a tonne of present ideas at Boots. Boots is one of my must-do destinations when it comes to shopping for Christmas gifts for her and Christmas gift for him too. That’s where I go to shop for gifts A LOT (and not just in December). 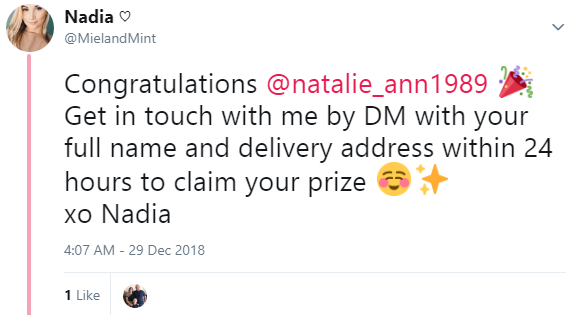 This year Boots reached out to me and have kindly offered me to select the most perfect and thoughtful presents for my family members, friends (and myself!) to be able to tell you all about my gift giving ideas this holiday season. I even picked out a present for you lot which I am going to give away. 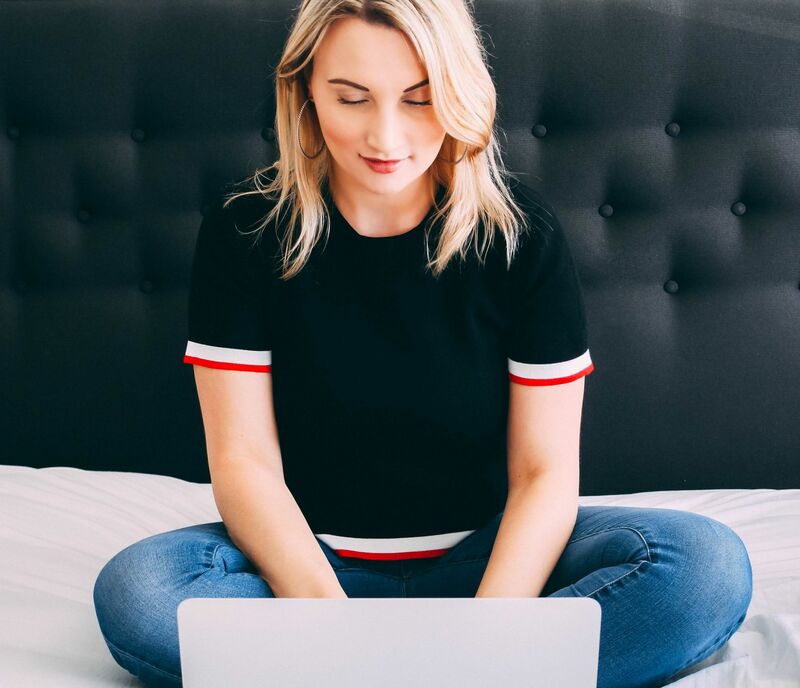 Keep reading and find details at the end of this post. Now, are you ready to dive into my Christmas gift extravaganza? It goes without saying that I love my mum. She’s the most wonderful woman in this world. When it comes to gifts, mum is quite easy to shop for as I know exactly what she likes and needs. She’s got an impeccable taste when it comes to fashion but she REALLY loves her skincare. Since mum’s skin is quite sensitive, she is extremely picky as to what products to use. La Roche-Posay is one of the brands mum loves and trusts, and, to be fair, it never disappoints. I am also a huge fan of their cleansers. 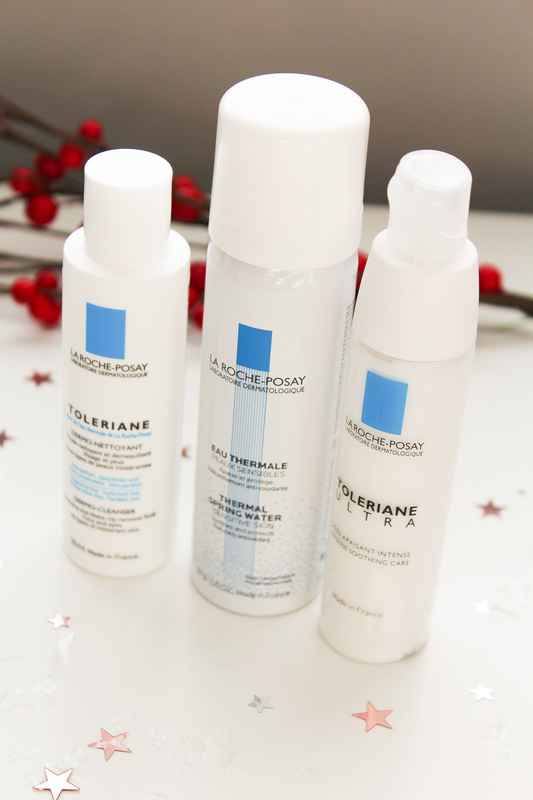 When I saw this lovely trio gift set La Roche-Posay Toleriane 3-Step System Sensitive Skin, I knew it was the one. I love that it includes all 3 essential steps in skincare: cleanser, toner, moisturiser. Mum loves it when her skin is left soft and hydrated after doing her skincare routine (we all do, right?! ), especially in the colder seasons when it tends to go dry and chapped. So this set makes it a perfect little gift because all these products are designed to make sensitive skin happy, refreshed and nourished. I always look forward to special dates or celebrations when I get to look for gifts for my mother-in-law. She’s so much fun to shop for and this Christmas isn’t an exception. My mother-in-law is a amazing woman who is very thoughtful and caring, so her gifts are never random. My husband and I always put a lot of thought into them. That’s why, when it came to my special Boots shopping spree, I selected a unique and beautifully-packaged gift set – Ted Baker Cherished Treasures Bow Gift in Pretty Pearl. Ted Baker is always on top when it comes to stunning packaging and high-quality contents. I mean, just look at this bow box and the goodies inside. I went for the fruity-floral body wash, body lotion and loofah trio, and I’m sure my mother-in-law will love it as much as I do. Someone who, without a fail, spoils my husband and I with presents every year, deserves to be spoiled too. This year we got my husband’s auntie very special cooking and baking related bits and bobs. 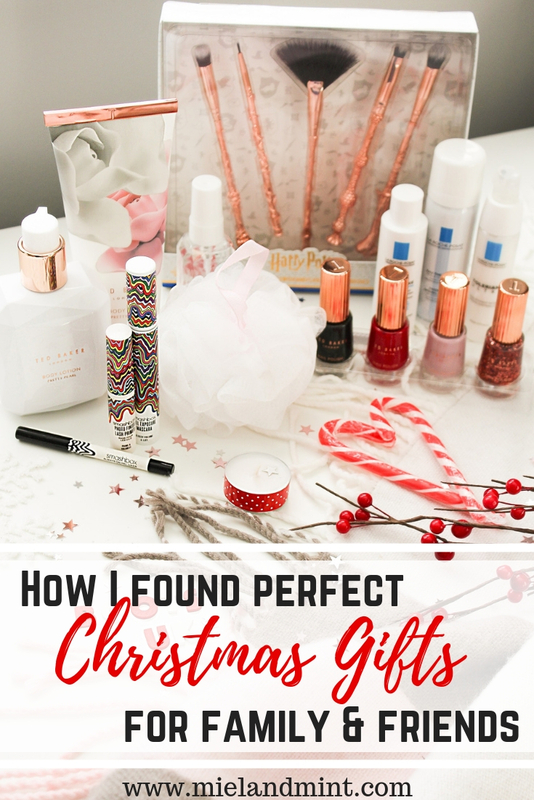 Also, I always make sure to include beauty goodies as little stocking fillers for her. I chose this cute mini Ted Baker Little Petal Pretty Pearl Body Spray (also available in this mini trio gift set) which smells super lovely! It’s got notes of rose, sandalwood and red fruits. It’s also a perfect size to fit inside a handbag. I might need to get one for myself too! As you can tell, I went wild with Ted Baker beauty products! I couldn’t help myself as Boots have so many beautiful Ted Baker gift sets. My friend loves her nail polishes so this was an easy decision. 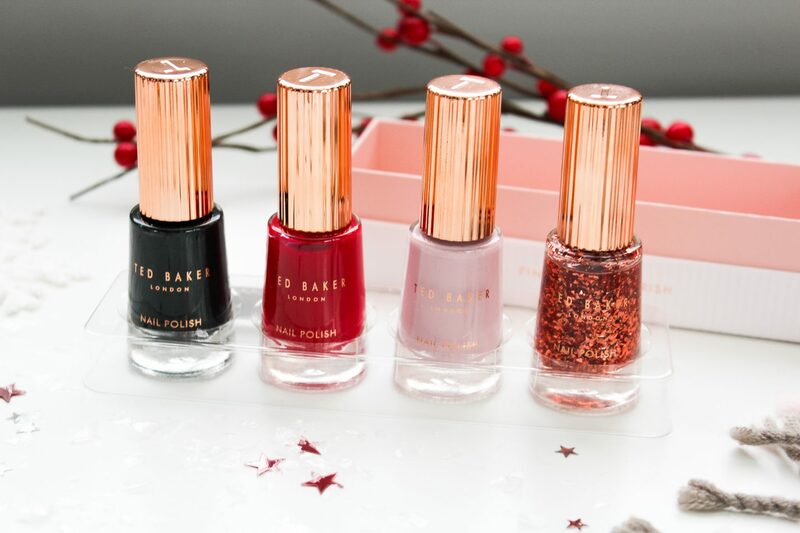 I just couldn’t skip past this stunning Ted Baker Finishing Flourish Gift nail lacquer gift set. The colours include (from left to right): Dark Green Shimmer, Red, Light Pink and Rose Gold Glitter top coat. I am crazy about all of them and think they are perfect for the holiday season. These shades hardly need the second coat and they are supposed to last days on end. They are so perfectly festive that I am going to get a set of these for myself! I am definitely in love with the rose gold glitter top coat one – that sparkle is just gorgeous. Now, I think I’ve been quite a good girl this year so I had to be my own Santa, right? Smashbox is one of my favourite brands when it comes to makeup. So when I spotted Smashbox Holidaze: Lash + Liner Set, I was swooned. The beautiful gift box includes an amazing lash primer, an unreal mascara and a fab gel liner. The packaging blew me away too. 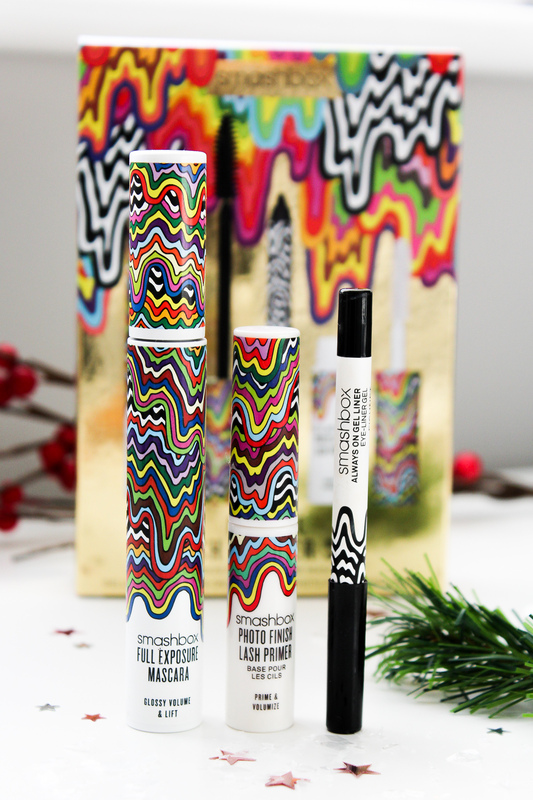 It was designed by an LA artist Jen Stark for this limited Smashbox Holidaze collection. I love those hypnotic colourful lines! So guess what – I’ve never tried a lash primer before (am I the last one on the bandwagon?). I was impressed what a huge difference it’s made. Something I will definitely re-purchase once I run out. I couldn’t recommend this gift set more for yourself or someone in your life who loves that lashes on fleek look (do people still say ‘on fleek’?). It’s time for a fun one! When I was looking for the gifts for the people I love (+ a little treat for myself), I thought of you guys too. 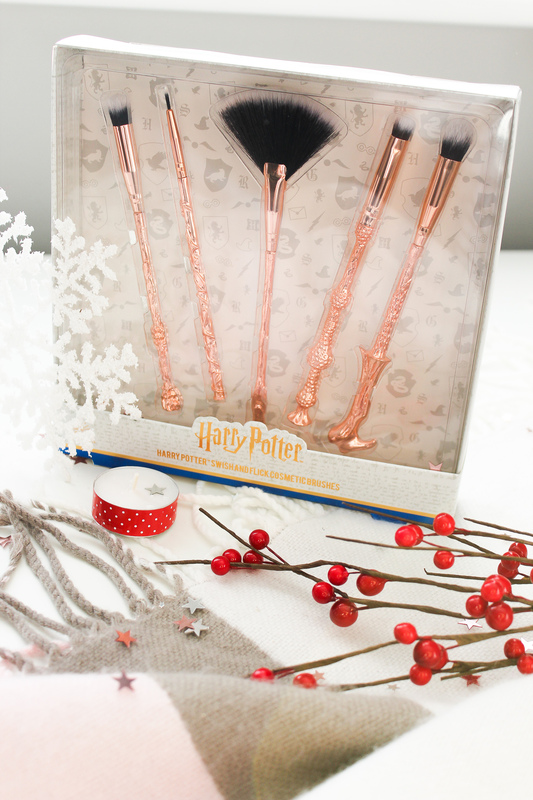 Since so many of you love Harry Potter and have a soft spot for a special makeup brush, HARRY POTTER™ Swish and Flick Cosmetic Brushes seemed like a perfect choice for a Christmas gift for you beautiful lot. To enter the giveaway, follow Boots UK & Miel and Mint on Instagram and leave a comment under this post on Instagram + tag a friend. For a bonus entry, follow me on Twitter and leave a comment under this blog post. and let me know what you think about my gift picks from Boots. What would you choose from their Christmas gifts section? How are you getting on with your Christmas presents shopping?